Kobe University (神戸大学 Kōbe daigaku), also known in the Kansai region as Shindai (神大), is a leading national university located in Kobe, Japan. It was established in 1949, and comprises nine graduate schools and eleven faculties. The university holds a total of about 15,000 students enrolled in undergraduate and graduate programs. As Kobe is an extremely cosmopolitan city, the institution welcomes oversea students, which accounted for a total of 963 students, as of 2005. It also has 2,800 staff members, including professors, associate professors and administrative officials. Located beside the foothills of lush green of Mount Rokko, the university provides a splendid view to the city and port of Kobe, providing a serene and ideal environment for the pursuit of academic studies, especially social science areas. Kobe University is one of the oldest and largest national universities in Japan. 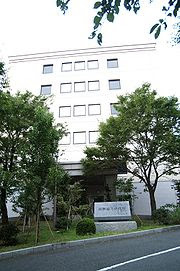 The roots of the university can be traced back to 1902, when the Kobe Higher Commercial School (神戸高等商業学校 Kōbe kōtō shōgyō gakkō) was established. Its first president was Tetsuya Mizushima (水島銕也? 1864—1928). In 1929 this school was renamed Kobe University of Commerce (神戸商業大学 Kōbe shōgyō daigaku), and it was further renamed in 1944, Kobe University of Economics (神戸経済大学 Kōbe keizai daigaku). 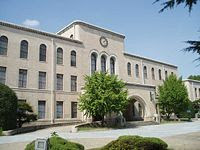 In 1949, under Japan's new educational systems, the university was merged with Hyogo Normal School, Hyogo Junior Normal School, Kobe Technical College and Himeji High School, all of which were in Hyōgo Prefecture, leading to the creation of Kobe University. From this period, the university has been expanded and has created new faculties to complement its main academic foundations, which is economics and commerce.